Toilet Foam Spray! Just a few sprays a day keeps the stains away. 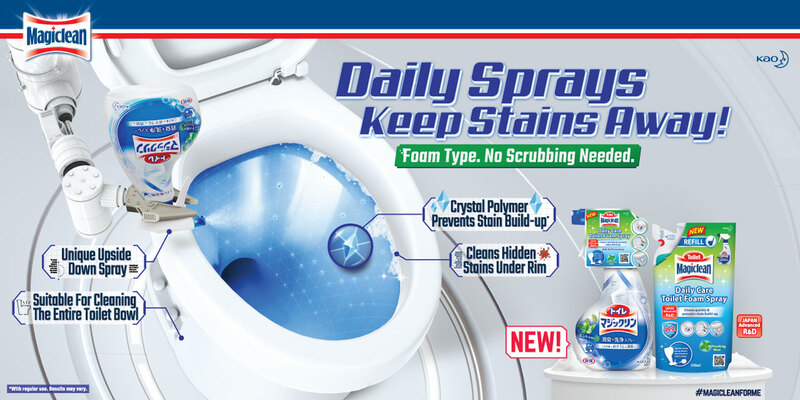 Not only is it the first foam toilet cleaner in Singapore, it also comes with a unique upside down format that reaches hidden stains & bacteria under toilet rims. It also contains crystal polymer technology that forms a shied with each use, preventing stain from sticking and accumulating. This means no more need for tedious scrubbing. Use it to clean the whole toilet bowl, including the toilet cover, tank, seat and even floor area around base of toilet. Just spray and rinse; so easy, anyone can use it! Kills 99% bacteria & comes in refreshing mint fragrance to keep your toilet always smelling fresh.